Preface: I got to the Campbell Recital Hall around 7:30 pm and two dozen people were there already. I brought Bly's Poetry Reading flyer to Waverley Writers last Friday, and noticed some of the poets there have come including my friend Terry Adams. The first two rows of the center aisle were reserved, so I sat on the second row of the left aisle. Soon Campbell Recital Hall was packed to capacity and some sat on the floor. Eavan Boland, Director of the Creative Writing Program, introduced Robert Bly. Here's what she said roughly from my notes "It is through the generosity of Nancy and Larry Mohr to bring Robert Bly to Stanford this semester as the Mohr Poet. I can't mention all that Robert Bly has achieved. At every turn, he refused to separate the citizen and the public. Through all the decades, he has kept an openness of language and craft. He is distinguished in translating the poems of Gunnar Ekelof, Georg Trakl, and Tomas Tranströmer. Bly is the first American to receive Swedish Tomas Tranströmer award for poetry . He has shown consistency in his approach to belief in values. Poetry can't never be decorative. It can't be divorced from ethos. He is a unique and beloved poet with his Minnesota background and his Harvard education. His classmates at Iowa Writers Workshop were W.D. Snodgrass and Donald Justice. In 1952 he received a Fulbright Grant to travel to Norway and translated Norwegian poetry into English. He is a poet with boundless energy. His some 30 books include Silence in the Snowy Fields , The Light Around the Body , which won the National Book Award. More recent works include Snowbanks North of the House , The Night Abraham Called to the Stars , and My Sentence Was a Thousand Years of Joy . His Iron John: A Book About Men  was on the New York Times Best-sellers list, and set off a somewhat controversial Men's Movement [laughter]. 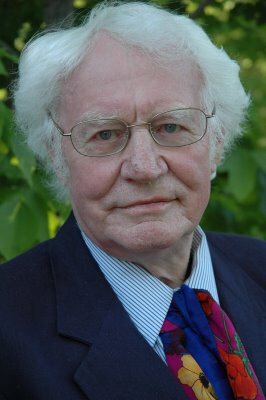 Robert Bly's poetry is one of vitality. It is with great pleasure that we welcome him to read to us at Stanford." Bly had many well-wishers after his reading including students requesting signing of his books. I told him how much I enjoyed his reading, and asked if any of the poems he read were from his unpublished works. Bly told me that all the poems he read tonight are from his published books. Here are my eight pages of notes of Robert Bly's poetry reading which ended at 9:05 pm. I went back to Green Library to type up the poems of Bly's reading from his books in the Stanford stacks. Some of Bly's books were checked out, but I was lucky to find Bly's Eating the Honey of Words and My Sentence Was A Thousand Years of Joy in the Los Altos Library on Sunday (May 11). I checked these two books out and typed six of the poems from them below. I also found Bly & Lewisohn's The Angel Knocking on the Tavern Door at the Stanford Bookstore. In the ten minutes before the store's closing, I managed to copy the Hafez lines missing from my notes "One Rose Is Enough". Now here is the complete Bly's Stanford Poetry Reading for those who love poetry. Robert Bly: Thank you Eavan for the lovely introduction. I'm glad to be here at Stanford. Thoughts that go so far. the son stops calling home. and makes no more bread. and loves him no more. he turns away from his wife, and she sleeps alone. through the unattached heavens alone. and did not climb the hill. Blown lake, a cabin of strong logs. To learn: the wind and the screendoor. Bly: I like to work with Marion Woodman. We often do workshops together. Once up in Canada somewhere, we went to a party and heard a Russian man telling a story that sounded like poetry. Not often do you find a poem in a party. The Russians had few doctors on the front line. Finished off four hundred men that way during the war. He never went crazy. They were his people. He'd say to the grass. 'We come and go. Now?' He went on watering the grass. I've been talking into the ear of a donkey. Of his ears. "What has happened to the spring,"
So I can lift my lips closer to the donkey's ear? Of form comes from the labor of its playfulness. We are drunkards who never take a drop. We all become ditch-diggers like Brahms. Each night to its old place in the night sky. Of bones eager to be laid away in the grave. Friends, we are salty, impermanent kingdoms. And lobsters play their bone guitars all summer. Heaven to be, and God to come, again. Comfortable earth and sumptuous heaven. Drinks his rum all day, and is content. Bly: Now I'm going to read from The Night Abraham Called to the Stars. These poems are in the ghazal form popular in Islamic poetry. Each poem has 36 syllables of 6 stanzas. This would have helped Milton and Pope [audience laughter]. You have to change the subject matter after each stanza. Every stanza ends with the same word. So you have to choose your word carefully. There are no rhymes in the poem. A humpback, and they're looking for a wife for Cézanne. It's hard for them to say, "So be it. Amen." "What beautiful teeth!" It's a way to say "Amen." To the swiftness of it all we have to say "Amen." But the best thing to say at a wedding is "Amen." Before Caedmon ever praised the Milky Way. "Praise God," "Damn God" are all synonyms for "Amen." And they show the rose-colored water, Mary says "Amen." The goose cries, and there is no way to save her. So many cheeps come from the nest by the river. If God doesn't listen, why are we listening? Very deep water covers most of the globe. Whenever I see it, I think of St. John. There is no remedy for deep water but listening. They search for each other through the whole deck. While we play our hands, they are listening. Abruptly jerked out of the water. For him, it is the end of all listening. To me from heaven, but I'm not listening. The arts and double the madness. Are you listening?" Let's tell the other story about Pitzeem and his horse. He bought a mare and a saddle and started out. Away. She turned and headed straight for the barn. All day but his sweet face with its long nose. Pitzeem! Pitzeem! How much time you've lost! He put the mountain between the mare's ears again. He slapped his own face; he was a good lover. Riding for years, but we're still only a day from home. "nonexistence" as the last word in each stanza. The bridegroom wanted to reach the Norwegian Church. But the roads were made impassable by huge snows. We are each the bridegroom longing for existence. Marriage brings the moth close to the candle flame. Are constantly flying into the fire of existence. Knows about the ocean. How can this be? Every drop of water longs like us for existence. Abu Said fasted in the desert for twenty years. Wept. "Your suffering gave me a hint of existence." Leaping about like a hare in the field of existence. Robert, you're close to joy but not quite there. Square, looking in at the festival of existence. Of love for the little creatures of nonexistence. Adam agreed the ocean would be the home of salt. We all understood our souls would hang by a thread. God agreed the pearl would be out of our hands. What did the Prodigal Son find inside his room? To an iron ball, a bed, and forgetfulness. I have written poems lying in so many small beds. Sometimes a cross hangs on the inside of the door. Mostly the dark of early dawn is in the room. On themselves the crime of baking the bread! This is what I say, "I want what's owed to me." A voice says, "We have our inheritance." Whose voice is that? Is that my old teacher? And the future should be out of our hands! Don't you see them? They are coming to blind Samson! But some of us don't want the day to end! If Samson goes blind, what will happen to the sea? Each night, while children throw shoes at the moon? I remember my mother's grief at sunset. Every father when he is wrestling with his son. Oh Lord of the Four Quarters he is destined to lose! You gypsy singers, make some raw cries! Call in the crows to fly over the plowed fields. I want the beating palms to cry out for Samson. To cry out against the blinding of Samson. I will always cry take away those knives! The human beings, for men are coming to blind Samson. helped in translating them from the Farsi. Strolling along gracefully for us is enought. Heared, a heavy glass of wine for us is enough. A room in the tavern for us is enough. That passes by so swiftly for us is enough. Is not enough for you, for us it is enough. With the soul friend for us is enough. To all space and time, for us is enough. Your beautiful flowing poems for us are enough. Bly: So that's my last poem for tonight. It's enough. After a rousing ovation from the packed audience. Bly sat down in his front row seat next to Eavan Boland. Then he got up and thanked the crowd, saying "I've been requested to read one more poem." Bly went back to the podium and read this last poem. Is the builder's plan of the castle of sugar. I don't mind your saying I will die soon. Your hands!" I showed my callused hands in court.